Patches are embroidered decors that you can sew directly on any fabric. There are many styles of patches that you can try but if you want to show your patriotism, then you can try flag patches. Where we come from plays a big part in who we are as individuals, and pride in one’s country is not uncommon. With Flag Patches, one is able to honor and represent the country they love by wearing an emblem of them. Featuring Patches that displays the flag of a country, Flag Patches are a great and fashionable way of baring one’s patriotism. Embroidered Flag Patches are sew-ons, meaning that they are easy to fix on any fashion item and can be relocated to another article of choice if the wearer so desires. Flag Patches are commonly found sewn on caps, tote bags, denim jackets, and jeans. Because patches come in a wide variety of styles, they can be mixed and matched and an individual can sew on several patches of their choice onto one article, making for a unique display of style and taste while also making show of their interests and personality. Show your patriotism by decorating your clothing with flag patches. Here are at e4hats.com, we have a wide selection of flag patches to choose from so that you can show your pride and support! Sew them on your jacket, hats, and anywhere you want! As the name implies, flag patches take on the design of the flags of your favorite country. Sew them on your cap, bag or just about anywhere you want them sewn. Aside from flag patches, there are other equally relevant patches that you can try and these include Military Patches, Service Patches, and State, Country Patches. Together with flag patches, you can sew these patches on anything and make an interesting collage about it. 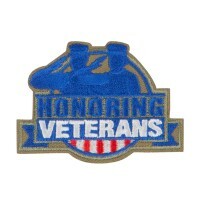 There are other embroidered patches that you can try aside from those that shoe patriotism. In fact, you choose those that will allow you to express yourself more. For instance, show people what you like by sewing Outdoor, Sports Patches or Lifestyle Patches on your clothes. The thing is that your choices of patches are not only limited to those that come with flag designs so be sure that you browse through our site to find the ones that you like.